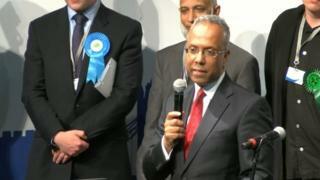 A report into allegations of fraud at Tower Hamlets Council reveals a "culture of cronyism", the government has said. The investigation has prompted Communities Secretary Eric Pickles to send in three commissioners to work at the council for three years. Auditors said the council grant system lacked transparency and some groups got cash without applying for it. The east London authority said it "regretted" flaws in its processes. The council said the report showed "no evidence of criminality or fraud" and issues identified by it had already been flagged up internally and were being "rectified accordingly". PricewaterhouseCoopers (PwC) was instructed by Mr Pickles to investigate "allegations about governance failures, poor financial management and possible fraud". It follows allegations in a BBC Panorama investigation that directly-elected mayor Lutfur Rahman diverted charity money for political support. Mr Rahman has denied all allegations of electoral malpractice. Mr Pickles said he had no choice but to appoint three commissioners to work with the council until March 2017 as there was "no place for rotten boroughs in 21st Century Britain". The report highlighted the "954 Fund" of £954,000 in surplus monies identified in 2012. So three commissioners are to be sent in to Tower Hamlets. They will be the eyes and ears of Eric Pickles, reporting to him every six months and overseeing large parts of the work of this east London council. They will effectively be in charge of handing out grants, of selling unwanted council property, of senior appointments and of many contracts the borough enters into. The last time the government stepped in in such a way was in Doncaster back in 2010. And it won't be a fleeting visit. They will be there until March 2017, unwelcome visitors with the right to oversee pretty much every move of the borough's directly elected mayor, Lutfur Rahman. Or at least, that's the theory. Tower Hamlets has two weeks to respond to the proposals and it's unlikely to go quietly. And of course, this being Tower Hamlets, a legal challenge may well be round the corner. It was found to have "no open application process at all, with monies targeted at member discretion" and in some cases grants were awarded to organisations ruled ineligible. The report also found that a proposal to award money to lunch clubs for Jewish, Sikh and Hindu communities resulted in £99,212 being awarded to Bangladeshi or Somali groups, none of which had applied for the money. The report also highlights the controversial sale of Poplar Town Hall to Dreamstar Ltd in 2011. The authority accepted a late, lower bid from the company, which was found to have an "association with the mayor", despite being advised to accept an offer from another bidder. Dreamstar's owner had helped the mayor in his election campaign. PWC said: "The acceptance of a late bid in whatever form created the possibility of manipulation, which could have been avoided or significantly reduced, either by excluding the late bid... or by delaying the opening of all bids." Dreamstar won the contract race but did not have the finances available to purchase the lease within the four-week timeframe. It also asked for and received the council's consent to change the contract to sub-let and to change the use of the listed property. This was granted at the discretion of the planning officer, rather than referred to the development planning committee, as would be expected. PWC said the actions showed the "existing governance arrangements have weaknesses". Addressing the House of Commons, Mr Pickles said: "It paints a deeply concerning picture of... denial, secrecy the breakdown of democratic scrutiny and accountability, and a culture of cronyism risking the corrupt spending of public funds." The council has 14 days to consider and respond to the proposals. Mr Pickles said: "The report has cost just under £1m which will be borne by the council. It would have been much cheaper had the mayoral administration not been so obstructive. "In all of this it is the residents of Tower Hamlets that have been let down." In a statement, Mr Rahman said he was "surprised at the secretary of state's comments". He said: "I believe that there is a huge disparity between the detail of PwC's report and the level of the secretary of state's comments. "We will be responding to Mr Pickles in due course." The report also found that in response to the BBC Panorama programme The Mayor and Our Money, the authority spent £101,479 getting advice from law firm Taylor Wessing and PR consultants Champollion.